Abby here again for more yummy 1820s Green Dress construction info & detail shots! 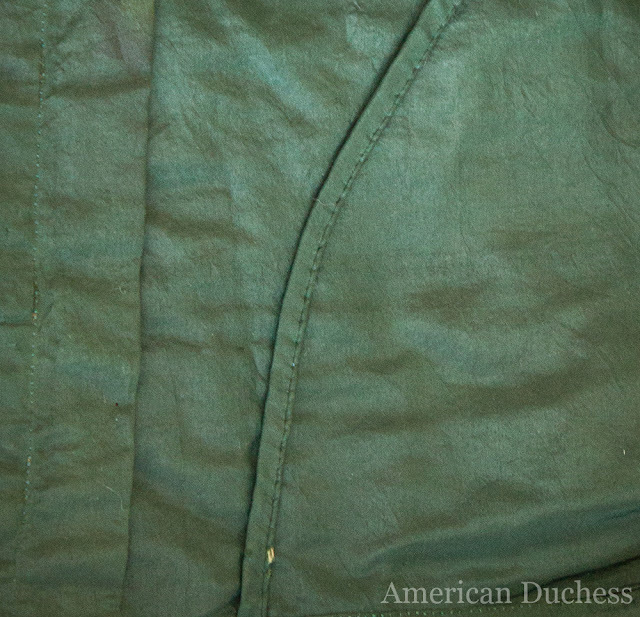 If you missed previous posts you can check out the general observation & sleeve details, dating, and the story behind the dress if you just follow the links. This is a shot of the interior of the neck. 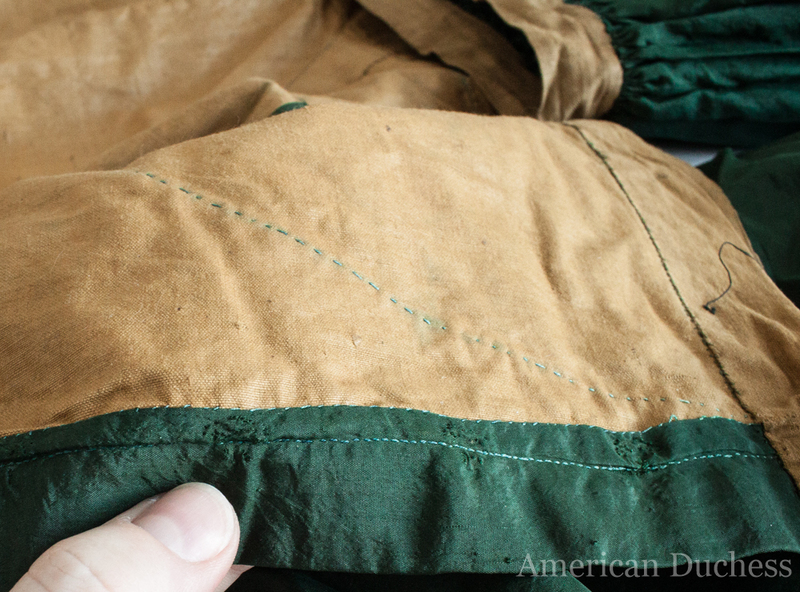 The small stitching at the edge is to hold the piping in place and you can see that the piping seems to have been folded over and whipped down to finish the raw edge. 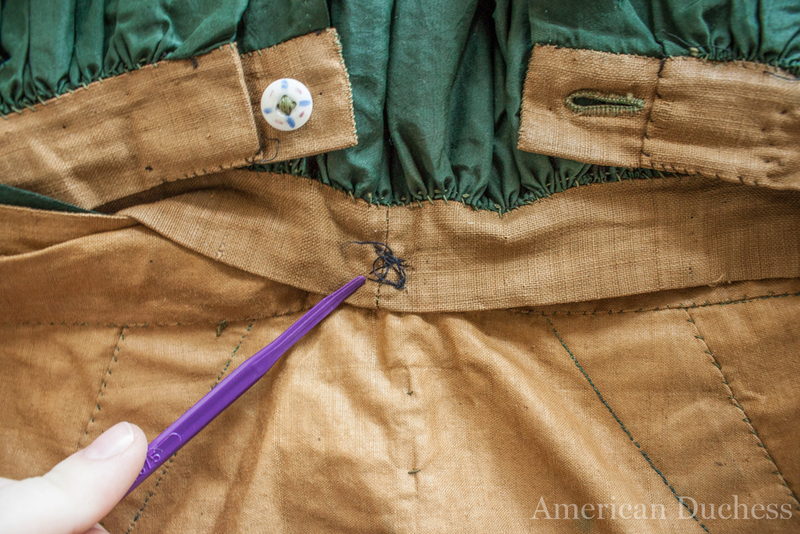 It's all sewn at about 10 stitches per inch. Moving down from the neckline this is a dart that was taken at the CF in what appears to be the lining only, and carefully stitched down with either running stitches or top stitches at 18-20 spi. This would be done to help shape the fabric around the bust and neck, as it puts the upper part of the bodice on the bias to accommodate curve. Further down you see a few tacking stitches that seem to connect the lining to the fashion fabric where the piping is. You don't see this stitch on the outside of the gown. The dress was fastened with hooks and eyes in the back that are now gone, but their evidence still remains. There were 11 hooks and eyes used in total. 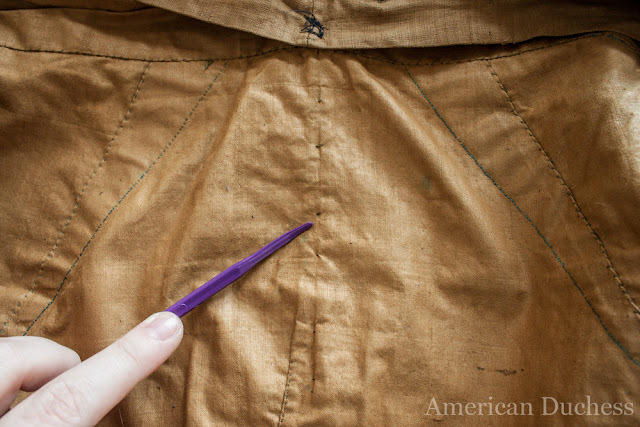 8 were on the bodice of the gown and 3 were on the waistband, which you can see the evidence in the picture above. The hooks and eyes on the bodice were about 1.5" apart. My thumb is at the shadow of where the old hooks were on the bodice. You can see that they were inset by about 3/4" which allowed for an overlap placket. 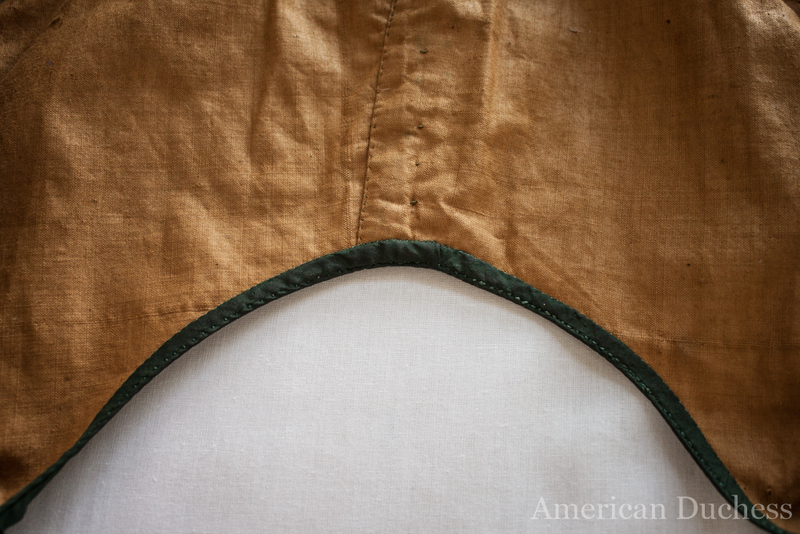 The bodice waistband is a separate piece that was cut on the straight of grain (1.5" wide w/ 1/4" seam allowance on both sides). It was folded and pressed at the bottom, but as you can see it wasn't hemmed. This is between the waistband showing the amount of fabric that was taken up in the bust dart. 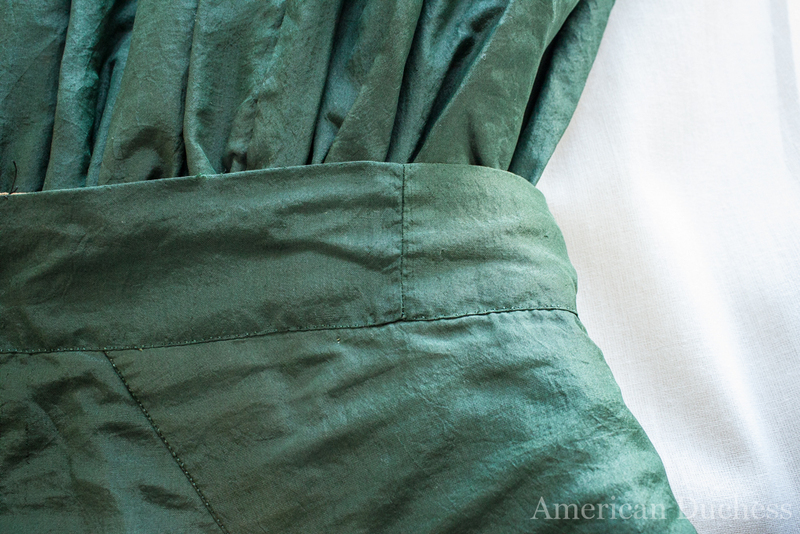 The seam allowance on how the bodice is attached to the waist band changes. 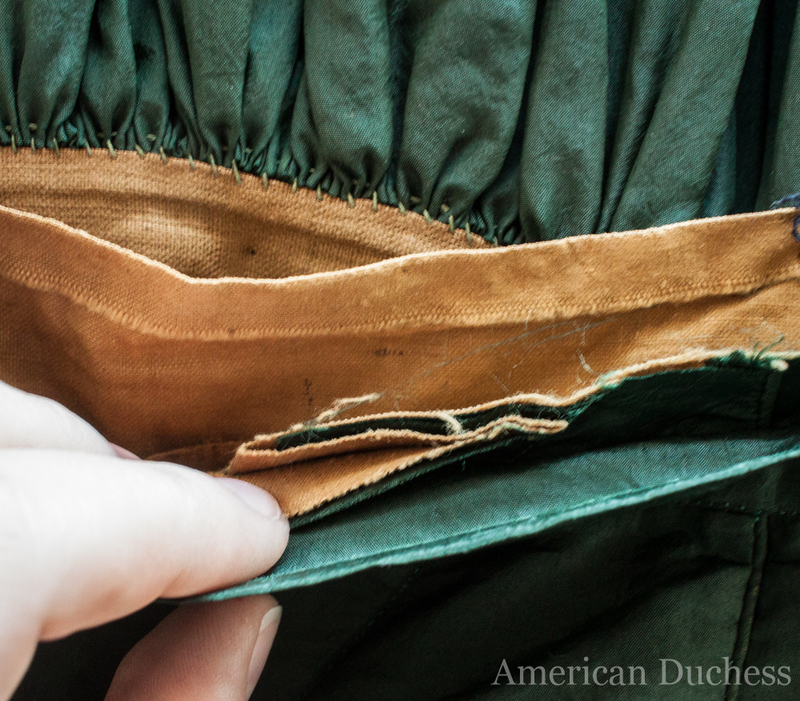 The CF bodice and waistband have a 1" seam allowance while the CB drops down to only 1/4". Here's the center front of the bodice, you can see the large bust darts that go out of the shot and the piping that is at the center front. 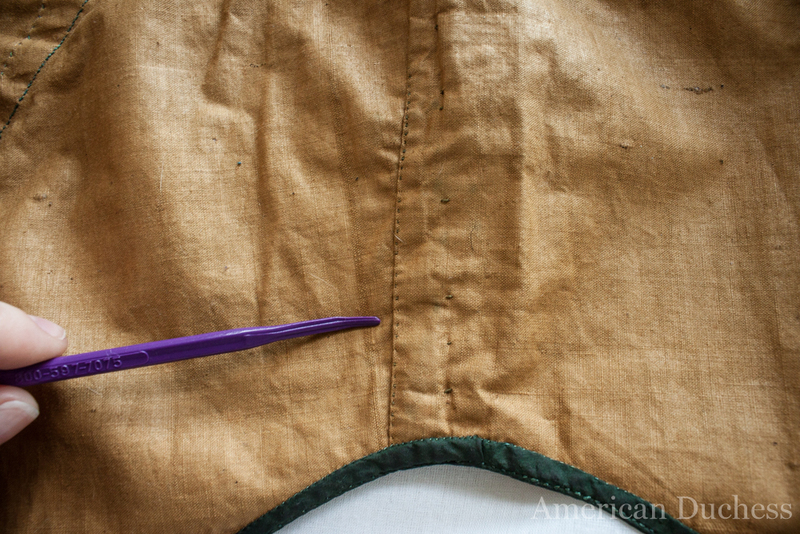 Even though the dart in the lining helps curve the lining over the bust, and it seems obvious that the silk would do the same, I actually had a hard time following the grain line to confirm that. 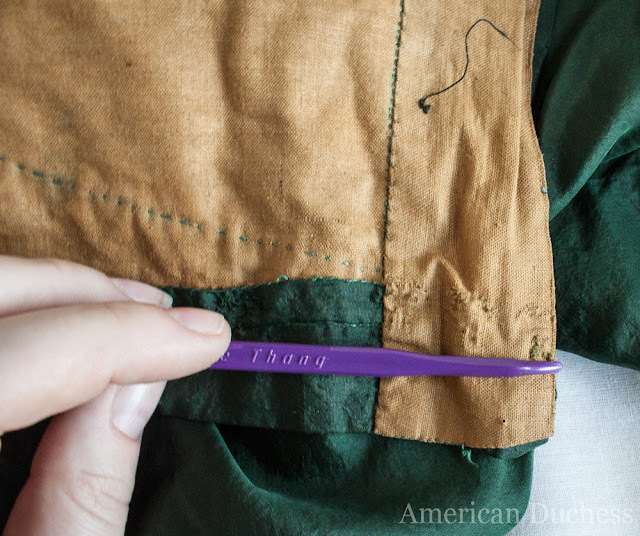 Here's a detail shot of the bust dart, you can see that it is VERY long, and is top stitched/prick stitched from the outside. The stitches are about 18-20 stitches per inch! And finally, we have the back. 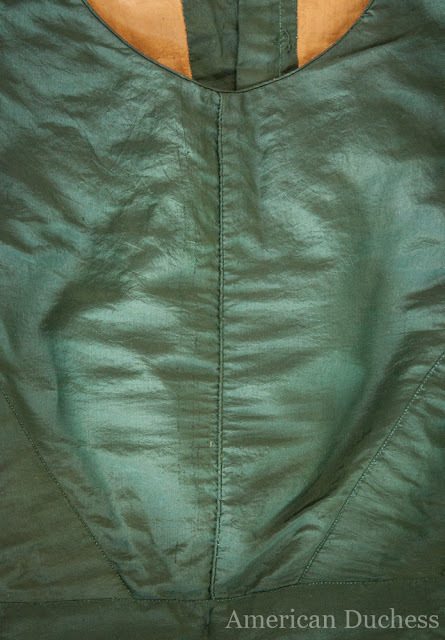 The curved "seam" is actually just decoration, and is created with folded silk and piping to give it it's structure. 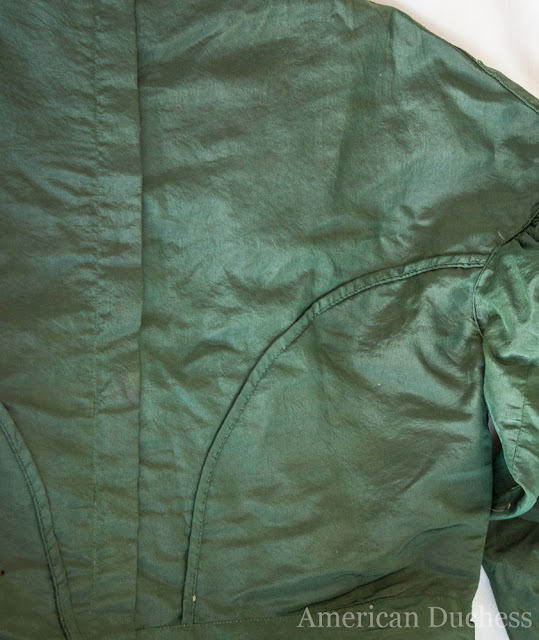 Here's a better detail shot where you can see a bit of yarn popping out and where the trim is attached to the bodice, between the piping and the folded parts. 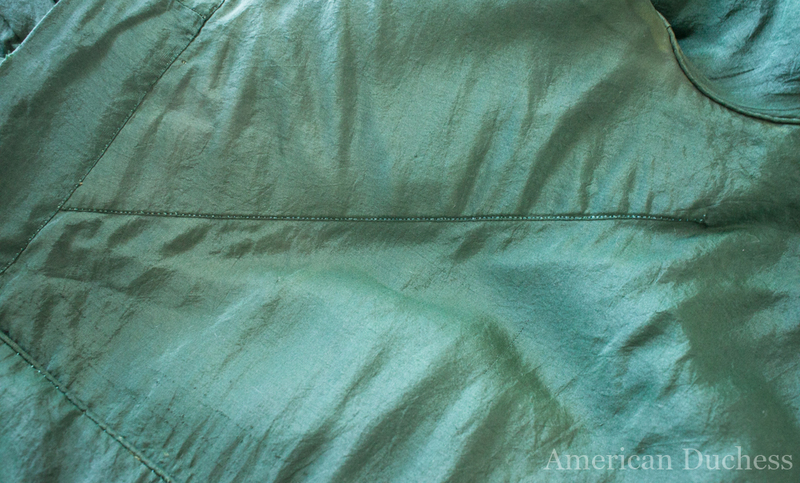 You can also see how the placket lays in the back too, and how those stitches are visible. Ok! That's it for now with the gown (sorry it took so long to post! eek!) Next post will be about the skirt construction! Thank you for taking the time to post this, it's so fascinating to see all of these little detail of the bodice construction.